Today, I want to educate you about the Maryland Outstanding Unit Ribbon. I received this ribbon for my deployment to Kosovo from 2006 to 2007 with the Maryland Army National Guard. As part of the 29th Infantry Division we deployed to Kosovo (Camp Bondsteel) in order to provide a safe and secure environment. Our deployment was 16+ month’s long, with 12 months boots on ground in Kosovo. Each member of our Task Force received the ribbon at our “homecoming ceremony.” We were each presented a ribbon and certificate signed by our state’s Adjutant General, BG Leacock. In case you would like to know more about the award, here’s what I found online. Description: The ribbon is cross-grained and consists of vertical stripes of black gold, black, gold and black. 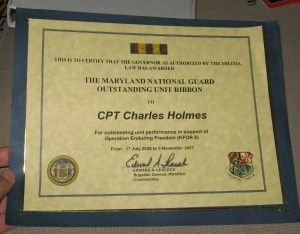 If you’ve ever been awarded the Maryland Outstanding Unit Ribbon before, I would love to hear from you. Leave a comment to let us know when you got it and what you did to receive it.